Tetris DS has played an important role in helping Nintendo DS being what it is today. Nintendo DS most probably wouldn’t be as successful if it weren’t for Tetris setting it up. What made the DS very appealing when it first came out is that along with it came Tetris DS, and everyone was just waiting to get back into the good old block-falling action. So what makes Tetris DS special anyway? It is Tetris. Everybody knows Tetris. You will be lucky to know someone who doesn’t know what Tetris is. Most, if not all, who played Tetris, liked it. Modes, modes, modes. Tetris DS comes with a lot of modes. Some you may have encountered already, some most likely you haven’t. Tetris DS has some completely unique modes like the Catch mode, Push mode, and others. The Touch mode deserves special mention because in the Touch mode, we can see how Tetris DS uses some of the more powerful features of the DS system, the touch screen. In this mode you can use your DS stylus to slide the blocks around giving us a fresh new way to play this classic game. The graphics are colorful and beautiful. A huge improvement that can be seen immediately with a lot of beautiful backgrounds and variations. Also, with the different modes, you have different display themes that come from some of Nintendo’s most successful games like Mario Bros., Metroid, The Legend of Zelda. and others. Multiplayer modes are just plain cool. Although you can only go head to head on push mode and mission mode, you can connect up to 10 players with just 1 playing card in standard mode. Now that’s fun. 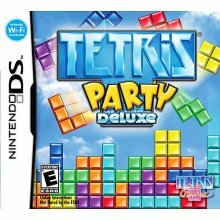 There are also a few other puzzle games in the list of the best games for Nintendo DS, but Tetris DS is at the top of them all. When it comes to puzzle games, Tetris is the number 1 name, and with its remake in the DS system, it just got better.